My perspective on teaching reading has completely transformed over the past three years. In retrospect, I can now see that when I began teaching reading, I had no idea what it truly meant to be a reader, nonetheless, a reading teacher. In fact, I think that is why reading was my least favorite subject to teach. I didn’t always see the value in teaching stories. It seemed rather odd to me. When I learned more about reading strategies, and when I adopted my current philosophy of being a teacher of thinking, my perspective on reading completely changed. Instead of teaching stories, I began to view reading as a way to teach students how to uncover a message and solve a puzzle. This week’s lessons have been a testament to that. My team and I have been trying to fulfill Common Core Literature Standard 4, which asks students to compare the structural elements of prose, poetry, and drama. While it sounds a bit boring, it definitely does not have to be. Of course, the purpose of any reading lesson is comprehension, so it was only natural for us to find a way to link this to some sort of deeper understanding of text. I decided to try repeated readings of the same poem, something I’ve never really tried before. Yes, we’ve reread texts for a different purposes, but we’ve never purposefully repeatedly read the same text multiple times within one week. 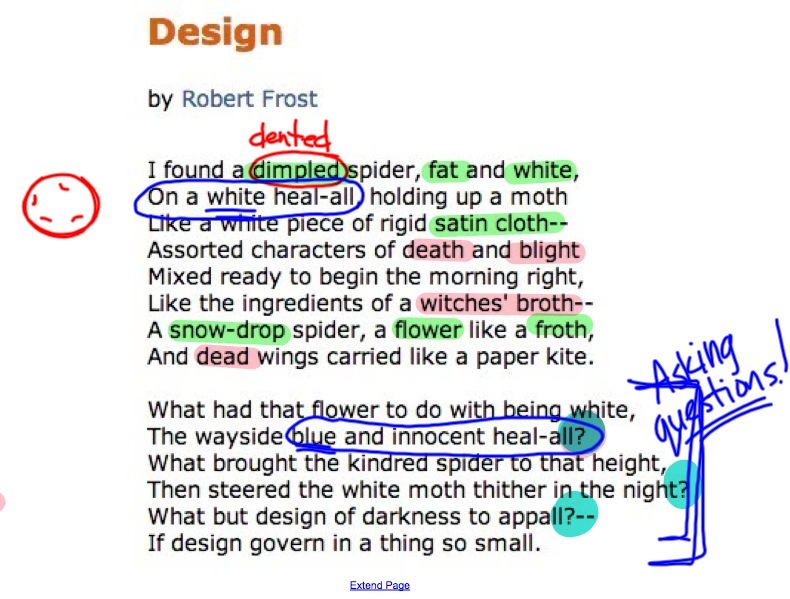 For this task, I chose Robert Frost’s “Design,” an exceedingly complex poem, especially fourth graders. On this first day, the children noticed extremely basic patterns, such as the rhyme scheme, a few similes, but they did manage to pick out some of the color references: very white towards the beginning, and darker towards the end. In addition, they developed a very literal sense of the poem through vocabulary clarification and discussion amongst their peers. They discussed the spider, on top of it’s “web” (at the time, they did not know that a heal-all was a flower), who had a moth for dinner. They also talked about how it was a “scary” scene. We left our discussion at that on Monday, as I did not want to exhaust the topic, and they had received appropriate practice with some of these new poetic terms. Today, we revisited the poem. I began by having them reread it to themselves, importing the poem into Educreations, and highlighting or underlining words or phrases for patterns once again. I did not allow them to look at our annotations from Monday. They came up with some of the same patterns again, specifically the rhyme scheme, and some of them remembered the color references, as well. One of my students brought up how the beginning of the poem seemed “happy.” She said that the author used words like “dimpled” and “satin cloth,” highlighted in green, and that it changed when the author used words like “death,” “blight,” and “witches’ broth.” It started to get scary. In fact, she mentioned that the tone was changing. As we kept reading, the kids noticed that the lines alternate, somewhat, between positive and negative connotations. I was rather impressed with their observations. Then we looked at the second stanza. Admittedly, the wording in the second stanza is much more complex, but I wanted them to see the unique turn the poem takes there, and they hardly needed to read to see it. I posed the question, “What is the author doing in the second stanza?” They had to look for a second, but soon enough, a few students mentioned that he was asking questions. It’s funny, because as the year has progressed, I’ve noticed that I don’t have to pose too many questions anymore, they seem to have started to pose them all on their own. In fact, I did not really plan for the conversation to go this way today. Not only did it cater to their current position with the text, but it also made the thinking more authentic for them, in my opinion. This is where their thinking halted. One of my students mentioned something about the “design” in the poem, an excellent entry point for our discussion on Friday. Regardless of the outcome, here is what I realized today: Repeated readings pave the way for authentic discussion and allow students to approach texts from a different angle. It is exceedingly obvious that the reading we did on Monday was extremely different from the reading we did today, and I provided very little assistance in the comprehension either day. They reached a deeper level of understanding all through asking questions and looking at structure. 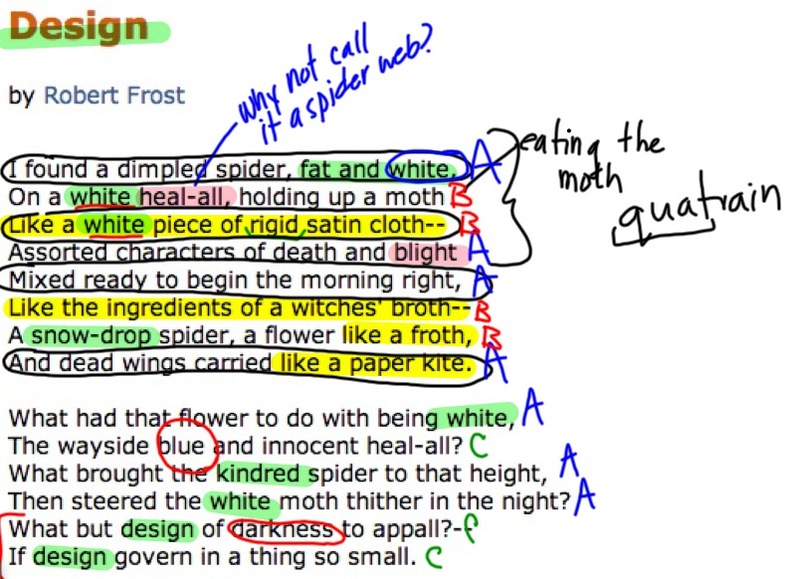 They realized there was more to this poem than just a spider and moth–all on their own. Have they figured out what it truly means yet? What the “more” in this poem is? Of course, not. Will they? It’s possible, but it’s also possible that they won’t. However, actually figuring out the meaning is not the most important part. The more important idea here is that they have realized there are multiple layers to text, that rereading allows us to uncover different meanings–meanings and messages we did not see the first time. Just as I realized a few years ago. I can’t wait until our Friday discussion.